With all of the pretty limewashes & grayed finishes we're seeing everywhere, I find myself appreciating beautiful warm aged wood all the more. With the internet/ blogs/ high-speed pace of trends these days, it's easy to get "sick" of trends. It's kind of sad to me because (at least in my world) before I was so over-exposed to everything, I appreciated things longer. It feels as if trends are just taking a hold of us so strongly and then as soon as they become mass-marketed (i.e. Restoration Hardware) we start to dislike them. As I'm sure we've all heard before, if you go with what you personally love and with what's appropriate in your home, your design choices will withstand the test of time. (Although, just like a wardobe, lots of homes need tweaking to stay fresh.) So, I think that there are lots of homes & decor where the introduction of gorgeous weathered woods & gray finishes is perfection, but there are also lots of houses that just look contrived when these finishes are placed en masse inside. I'm crazy over Donna Brown's work, whom I read about on Cote de Texas. Her rich patinated spaces just look so warm & elegant. I love the shock of warm orange wood on the bed here... Lots of people are "over" this wood tone but I think this space just goes to show how wood tones & finished can be fresh & up to date as long as they're done well. ps- How was your Halloween??! We had so much fun & I'm so glad we did our party. Post yourself in your costume! Post yourself in your costume! 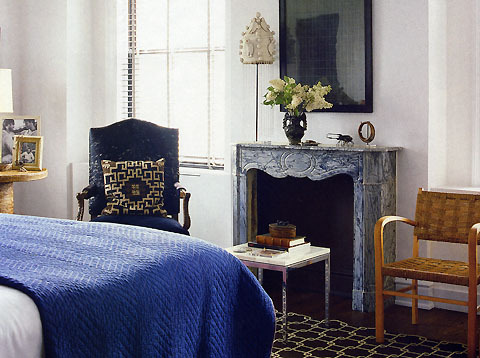 I love brown wood with blue (like in the Nate Berkus pic) or white (Nuevo Estillo). The only wood I don't like is when there's too much orange wood in one room- it gives me a headache! Beautiful post, Lauren. I could live in that kitchen, and I love the pillow in the 3rd image. Thank you for reminding me that to stay true to what works for your family and to what you love as opposed to launching a new "trend" is so important. I love the kitchen best of all of these lovely images. great post Lauren....so true about how our blogs have created this "burnout/saturation" of seeing some trend over/over and then we ARE sick of it too fast! thx also for reminding us all to stick to what's true to our heart in our own decor, & keep what "feels like home" no matter the trend. The fifth picture of the kitchen is probably my favorite since it mixes the old, the farm table, with the modern, the cabinets. That wall of windows is to die for, love all the light. Glad to hear you had fun at your party, nothing here since we live to far out in the country and it’s pitch black at night but the peace and quiet was nice. Now I'm not afraid of a little paint, but tend toward beautiful wood pieces. I love the depth and beauty of the grain. Although I do have some friends we can't BELIEVE I won't paint over some of my furniture. I'll be sending them right to this post from now on! THANKS! I love all the warm woods! Every room needs a little bit. The kitchen from Southern Accents in Rozanne Jackson's, owner of The Iron Gate in Franklin, TN. PS I agree Eddie does an amazing job and he is one of my favorite people. I'm just a color junkie. I crave it in the winter and I love it all summer. You can see what I'm talking about if you click through to my store. I do like black and white movies, though! My friend Mrs. G. did her house around the Jasper John's gray show. That post is called Nieu Neo Georgian featuring her interior design work with the fabulous Ruard Veltman who came out of the Bobby McAlpine studio. I agree, I don't know what's the deal with that trend of grabbing a can of spray paint and painting furniture black. 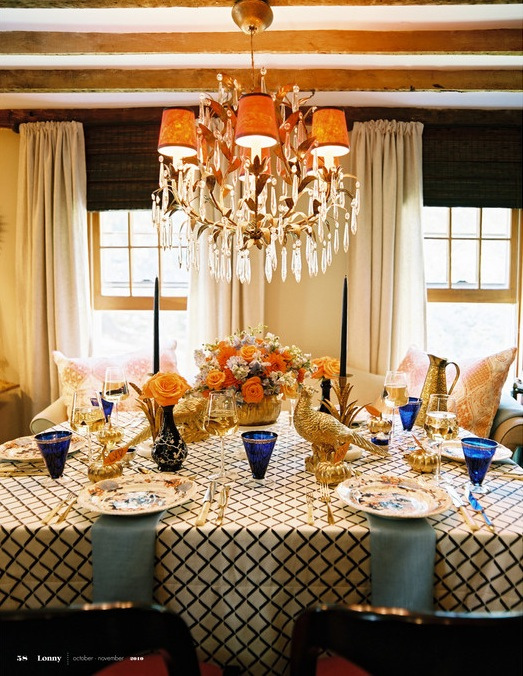 Each photo is beautiful - adore the table scape. Thank you for sharing. You said it perfectly! I love mixing woods, colors and textures...makes for cozy and collected interiors! 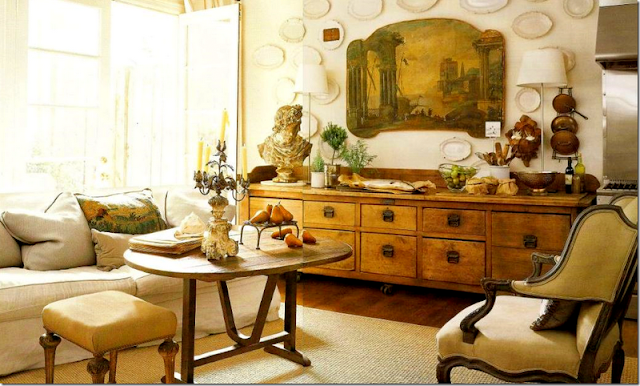 Beautiful rooms (especially loving the first one)- they all look so warm and comfortable but still chic. Thank you for saying it!! I cringe when I see some beautiful pieces being hit with paint! There is nothing prettier than warm wood tones! If you want to be trendy, paint your walls, not your furniture! Great post!! I completely agree, do what's right for you and your home will reflect that. I love warm wood, even though bleached and painted wood is in fashion I'm still an old classic. It seems that white or variations of white dominate most of the online designer's pages. I have five children and wouldn't think of using all white (even slipcovers because who wants to wash the couch every other day?). These warm colors and warm woods make my shoulder relax. I know it's the feel of the room as much as it means that kids are welcome to live in their homes, too. I love a room with warm woods and black iron accents. I guess that's why my house is filled with this classic combination. I used to love restoration hardware but since the redesign of their store, ..........I love their paint colors only. I am so with you. all these images look timeless though. Lauren, I love this post and you write so well! Really! I think you are going to have to write a design book (with beautiful photo's of course)! I really get what you are saying and since Restoration Hardware has gone all "natural wood", I have been a bit turned off to it all! It is beautiful but now too trendy! However, I need some pieces like that in my home. I try so hard to find something that no one has...an antique find...but it takes years...too long! I really don't want to open a catalogue and find my living room in there! Lauren, this may be your best post ever! I love what you wrote, and I agree with every word - especially what you wrote about using what you personally love and what is appropriate in your home! 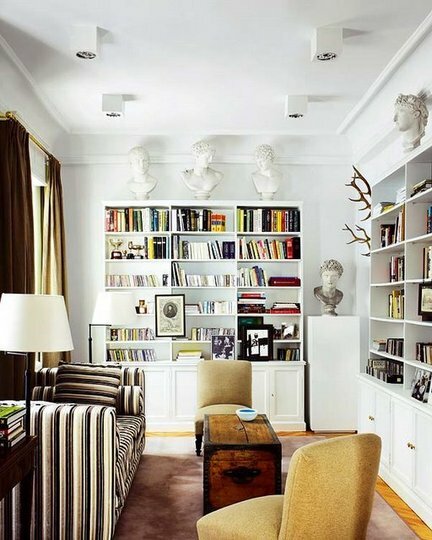 A room that is collected over time with things that we LOVE is the best! I love a room that says "come sit down, put your feet up and stay a while." All these images have a warm, collected over time feel. Gotta agree with you on the sticking with what you love vs. the trends! I totally agree with you. Especially after shopping HP Furniture Market and Atlanta. The main "trend" is the grayed wood/Restoration Hardware look. I am ready for warm, dark woods to come back. The best thing is to keep it mixed up and layered like the photos you've shown. Great post! My house is full of WARM woods like you have shown. I have never cared if it was in style... It's what I love, Although, I am excited to see that it's starting to gain fashion again. What beautiful spaces, I completely agree with you too. Things I used to love I seem to quickly hate after being overexposed to them on a daily basis. But the warm woods are so lovely and I too have been trying to incorporate them a bit more. Lauren, it's like you are reading my mind. I will be thinking about something and suddenly you post about it before I even had it formulated! When all the grey-wash thing came in, I was so conflicted as I do like the look but it looks dismal in the thin northern light of Calgary, at least in my house! So I brought in a grey basket and some brown-grey curtains and that was my nod to the trend. A few weeks ago, I decided that I most love the look of old antique "brown" wood. I like it rough and rustic, but especially glossy and dark, like a fine piano. I even posted a "Light and Dark" post about Mariette Himes Gomez's white walls and dark or medium brown furniture. 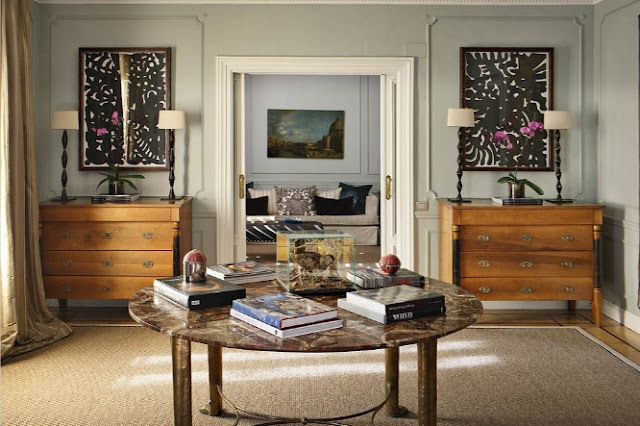 I decided this is the look for me - I am going to slowly try to find old antiques that have that glossy warm patina and that will be my style. I want substance and then I can change things around with these foundation pieces. I would lay in bed and think "I was grey, but antique brown makes my heart sing" while I felt utterly left out of the trend!! And of course before we know it, warm wood will be all the rage. I am not as keen on the yellows and prefer the mid or dark browns myself, like Trina has so much of (Country Farmhouse). It is a look I never tire of. Hope you are well!!! Hello to Dave and babies. Beautiful beautiful emages Lauren!! Great post! I so enjoy these warm Autumn colors! Thanks for the write up! It's interesting - my instincts have been sending me in a totally different direction for my home. I'm so sick of exposed wood and want to paint all of it! What I noticed in your photos, all of which are lovely, is that the wood leans towards weathered and light. I looked around a year or so ago and felt like I was drowning in dark glossy wood. It feels oppressive! Part of this is because I've inherited a lot of pieces and I've been intimidated to paint them. I was telling my in-laws about my plans to paint my (wood) kitchen cabinets this month and they were shocked. I've noticed a bit of a generational divide on this of people my age (twirtysomething) vs. my parents age (55+). I think for the older set there is a thinking that wood = good quality and painted wood = probably laminate and indicative of cheap materials. Obviously this is limited to folks outside the design industry as painting wood is more commonplace. I'm curious on your thoughts on it. And if you agree with my mother that it would be positively sinful of me to paint my cherry wood desk and drawers. just found your lovely blog through bijou and boheme. that living room is divine...i want to sink into that couch! little late to the discussion, but totally agree. 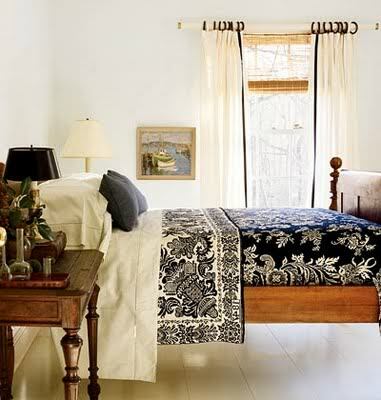 i think the bed pic is from cottage or country living. saved it forever thinking I too would install a plywood floor and paint it. never happened! :) thanks for staying true to what you love, it encourages me to do the same.